The client format for EDGE may contain multiple data tabs. You may select which data tabs are visible via the Tab Chooser. To access the Tab Chooser, click on the application menu button and then select the Show/Hide Tabs option. 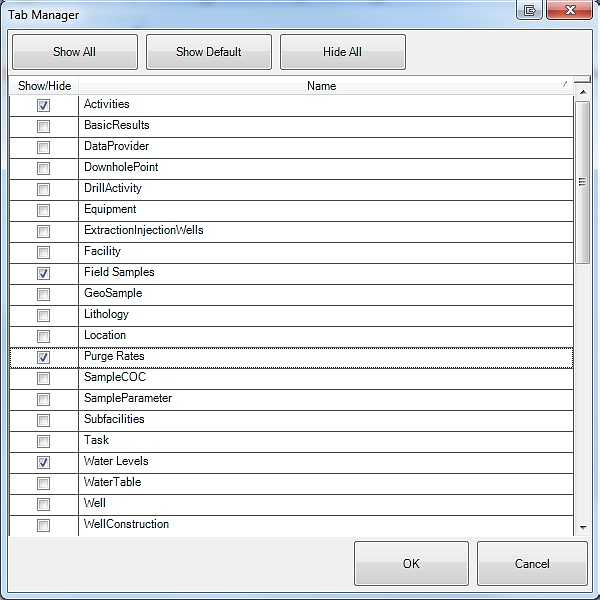 The following interface will be shown, containing a list of available data tabs for the selected client format. The example below applies to EDGE. Click OK to close the interface, EDGE will update the list of visible tabs. Note: EDGE will store the list of visible data tabs and restore it upon the next application run. If the desired tab is not available in the data tab chooser, it may need to be activated within the Configuration Plugin. Please note, if a large number of EDGE tabs are activated, EDGE may take longer to start.